The Passive House approach to design and construction is aimed at delivering energy efficient buildings that feel great to use. This is achieved through a combination of high levels of insulation and building seal together with natural ventilation. Passive House is effectively a building standard. At Lovell Chen, we think that this approach to sustainability — for both new build and adaptation projects — makes a lot of sense. As a technique, it embraces the whole fabric of a building in the service of energy use reduction. This is a good match for design in heritage contexts, where the conservation of original fabric is a major part of the sustainability aspects of a project. Passive House is only beginning to be embraced seriously by the Australian construction industry, and is little understood. The Green Star rating system currently used to measure sustainability is focused on the addition of elements designed to offset energy use or obtain energy from renewable sources, such as photovoltaic panels. In other words, achieving a result relies on changing people’s behaviour. The way a building is constructed in terms of ultimate low energy use is largely not addressed. For the adaptation of existing buildings, the Passive House approach is called EnerPHit. The idea is to do what you can to reduce energy use without impacting on the heritage aspects of a building. It requires an in-depth understanding of how an existing structure and fabric are operating — for example, where the moisture might be sitting in a wall — enabling appropriate interventions aimed at meeting as much of the Passive House standard as feasible. The biggest challenge is implementing a Passive House approach in a country where the construction community is still learning about it. Experience is needed in the techniques involved and in appreciating the quality standards required. Materials and technical systems, such as specialist windows, membranes and insulation, are all imported, so knowledge in this area is also important. A perhaps unexpected challenge is the Building Code. Issues relating to Passive House principles have not been incorporated in an holistic way, which has led to contradictions with measures required for Disability Discrimination Act (DDA) compliance, for example. Lovell Chen Principal Milica Tumbas is a certified Passive House designer and consultant. Completed for the commencement of the 2016 teaching year, the new Lovell Chen-designed Wade Institute building was constructed using Passive House principles. 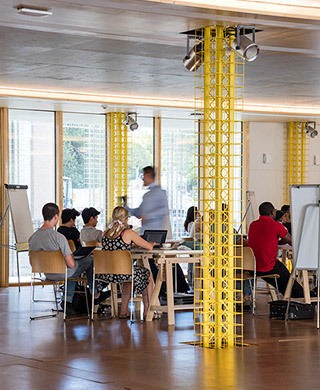 The open plan main teaching space features a highly insulated floor slab — including around the footings — connected to the specialised wall/window system and the roof slab above in one continuous barrier.